불상을 모시기 위해 나무나 돌, 쇠 등을 깎아 일반적인 건축물보다 작은 규모로 만든 공간을 불감(佛龕)이라 한다. 불감은 그 안에 모셔진 불상의 양식뿐만 아니라, 당시의 건축 양식을 살필 수 있는 중요한 자료가 된다. 43.3㎝ 높이의 금동불감으로 정면 전체를 여닫이식 문으로 구성하여 예배나 의식 때만 열어서 볼 수 있게 되어 있다. 좌우 문 안쪽면에 칼을 든 인왕상이 1구씩 돋을새김되어 있는데 정교하고 생동감 있게 표현되었다. 정면 벽에는 중앙에 비로자나삼존상과 주위에 10대 제자상을 돋을새김하였다. 비로자나불상은 전형적인 8각의 연꽃무늬 대좌 위에 앉아 있다. 손은 양 손을 가슴에 올리고 왼손 검지손가락을 오른손이 감싸고 있는 모습으로 당시의 비로자나불이 일반적으로 취하는 손모양이다. 얼굴이나 신체는 단아하며 대좌는 비교적 정교한 편이어서 격조 높은 조각솜씨를 보여주고 있다. 좌우 벽에는 꽃무늬들이 화려하게 새겨져 있고, 천장에도 여러 무늬가 섬세하게 조각되어 있어 화려하고 장엄한 부처님의 세계를 표현하고 있다. 입구 문을 열면 좌우에 금동불 2구가 모셔져 있는데, 위로 향한 연꽃무늬와 엎어놓은 연꽃무늬로만 구성된 고려말 조선초의 전형적인 대좌 위에 앉은 같은 수법의 불상이다. 얼굴이나 신체는 단아하지만 다소 경직된 표현이 나타나고 있다. 벽면에 돋을새김한 불상들은 비교적 얼굴의 형태나 옷주름의 묘사가 유연하고, 꽃무늬 같은 무늬가 화려할 뿐만 아니라, 인왕상의 힘차고 발랄한 표현 등은 이 불감이 뛰어난 작품임을 보여준다. 흔히 나옹화상의 원불(願佛)로 알려져 있으며, 불감 뒷면에 불상은 신승, 불감은 김치, 박어산 등이 만들었고, 박씨 부부가 시주하였으며, 신음 등 네 승려가 참여하였다는 내용의 기록이 있어 흥미를 높여 주고 있다. 이 불감은 삼신불과 삼세불의 도상이 융합되어 도상적으로 매우 의미 있을 뿐만 아니라 여말선초의 조각, 회화, 금속공예, 건축양식, 문양 등을 알려주는 매우 귀중한 작품으로 평가되어 전라남도 시도유형문화재 제29호에서 2008년 3월 보물로 승격지정되었다. Buddhist portable shrines, carved out of wood, stone or metal, were for personal or mobile worship rituals. With Buddhist images enshrined in a small ornate space, they often provide useful glimpses of architectural and sculptural styles of the time they were made. This portable shrine, with a height of 43.3 centimeters, houses two gilt-bronze Buddhas against the main wall, on which the Vairocana triad and the ten disciples of the historic Buddha are carved in relief. It is designed to be opened fully with two hinged front doors, each adorned inside with an elaborate image of Vajrapani, the dynamic protector of Buddhism, holding a sword. The Vairocana is depicted sitting on an octagonal lotus throne, with both hands raised to the chest in the vajra mudra, or the gesture symbolizing wisdom, typical of the Buddha of Great Illumination. The elegant face and body and the exquisite lotus pedestal all display refined carving technique. The side walls are carved with gorgeous floral patterns and the ceiling has colorful decorative designs, expressing the beautiful world of the Buddha. Compared with the Vairocana and other figures carved on the wall, the two gilt-bronze Buddhas are rather stiff in spite of their elegant faces and bodies. Both images sit on a lotus pedestal in the typical late Goryeo to early Joseon style, which consist of two tiers of lotus petals, facing up and down, respectively. Generally the relief images on the wall have notably fluid lines and gentle expressions. The two Vajrapani figures add to the overall energetic and lively feeling. Commonly known to have been the tutelary Buddha of Buddhist Monk Naong (1320-1376), the portable shrine has an inscription on the back wall, which notes that the altar was made by Kim Chi and Bak Eo-san, the statuettes were carved by Sinseung, and four other monks participated in the work, which was funded by a man named Bak and his wife. 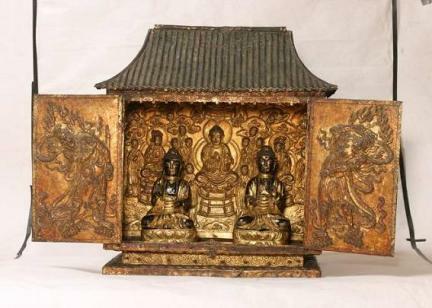 The portable shrine is a significant object for research of Buddhist icons. It embodies faith in the threefold body of the Buddha, or Trikaya, and the Buddha of the past, present and future. The portable shrine of gilt-bronze Buddhas also shows important aspects of the sculpture, painting, metalwork, architecture and decorative patterns of the late Goryeo to early Joseon Dynasty. Therefore, in March 2008 it was promoted from Jeollanam-do Tangible Cultural Heritage No. 29 to Treasure No. 1546.